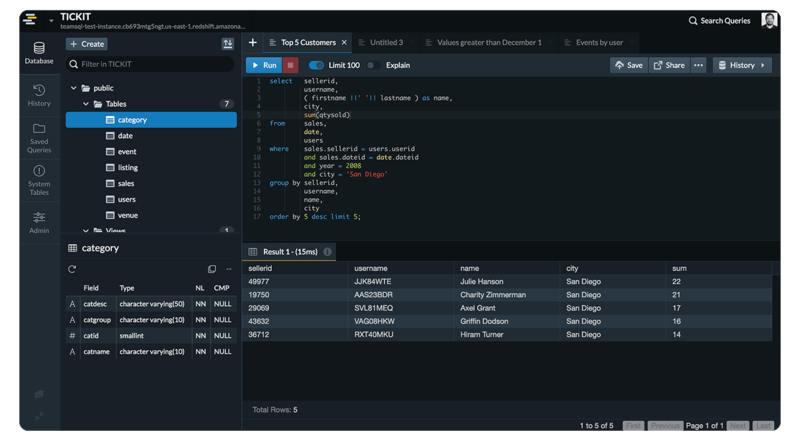 TeamSQL works with multiple database engines, including: Oracle, MySQL, Microsoft SQL Server, PostgreSQL, AWS Redshift, Redis, Amazon Aurora, MariaDB or CitusData. Connect to just one engine type, or connect to all -- the choice is yours! To help you keep track of which query windows belong to which database engine, TeamSQL automatically color codes everything in the user interface for you. TeamSQL supports SSL connections to ensure that your data stays out of unauthorized hands. TeamSQL supports secure connections to your servers via SSH tunnels. Flag your connections to your production server to prevent them from being confused with your development or test environments. TeamSQL will display visual indicators to help your production servers stand out from the rest. Regardless of whether your databases are hosted on Amazon Web Services, Microsoft's Azure, Google Cloud, or your on-premise servers, TeamSQL can connect to all of your databases. This article cover how you can connect TeamSQL to your Amazon Redshift database servers, as well as how you can connect using SSL. See how we add a new MySQL connection via SSH tunnel in TeamSQL.